I know! I know! 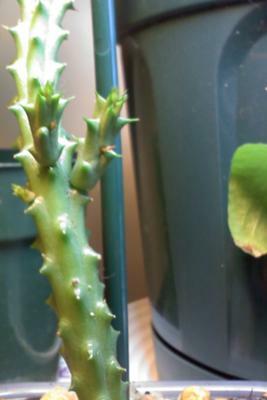 It's some type of Huernia based on the growth habit, but until it flowers, it's hard to tell. The flowers of Huernia are usually dark rich velvety red, resembling nothing so much as ... blood. Why, you ask? That's because the flowers along with smell of these 'carrion flowers' also has been developed to resemble the look and odour of rotting meat, to attract the valuable pollinating insects - in this case, flies. I wonder how disappointed the flies are when they discover just a stupid flower, there's no rotting meat here...and fly away, only to discover yet another of the stupid flowers, waiting for the pollen. Another type of plant also called carrion flower is Stapelia which generally have unique, much larger flowers, with an alien quality about them. You can find some examples here: Stapelia. Once it blooms, you'll have no trouble identifying it at least as to which genus it belongs to.